Ideal for an omega necklace, heavy chain, or try a lapel pin and pendant combo. So you could enjoy it both ways! This gorgeous Morgan pendant has a fabulous two dimensional design, a nice full bodied look without weighing a ton. With its size its hard not to notice this one. A real attention getter! 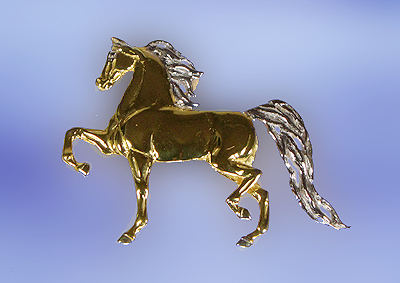 Rhodium plated mane and tail offering a two-toned finish. For added elegance try this piece in a brushed design, sure to bring out the mane and tail. If you would like to be bold, pave diamonds in the mane and tail for a facsinating Morgan design you can be proud to wear and love.